Sorry... the 2017 Jeep Cherokee is no longer being sold as new. Instead, take the first step to a great deal on 2019 Jeep Cherokee with a free price quote! 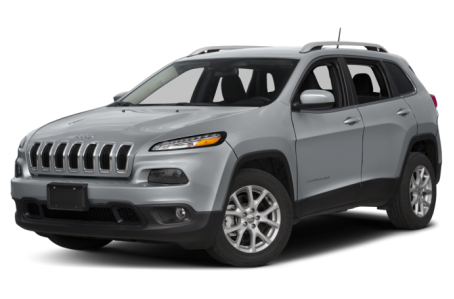 The 2017 Cherokee is a mid-size SUV that seats up to 5 passengers. It competes with the Ford Edge, Toyota 4Runner, and Nissan Murano. This year, the Cherokee gains standard HID headlights and more interior features for the Trailhawk trim. Five trims are available: the Sport, Latitude, Limited, Overland, and Trailhawk. Two other Special Editions are available with limited production: the Altitude and High Altitude. The uniquely styled Cherokee has a 7-slot front grille and narrow-slit headlights. The underbody is clad in black for a rugged appearance, but body-color trim is also available. The front windshield has a low-profile, subtle slope for better aerodynamics. Standard features include power side mirrors, a rear spoiler, and 17-inch steel wheels. Underbody skid plates, a panoramic moonroof, and a power liftgate are available for a better off-road experience. Under the hood, the Cherokee has two engine options: a base 184-hp, 2.4-liter 4-cylinder engine and a more powerful 271-hp, 3.2-liter V-6 with start-stop engine technology. Both engines are mated to a 9-speed automatic transmission and front- (FWD) or 4-wheel drive (4WD). There are three different 4WD systems available that range from a relatively basic one with a single power transfer unit that controls torque between the front and rear wheels, to a more robust system that adds a locking rear differential and Selec-Terrain traction control, which offers up to five customized suspension and crawl settings for different environments. Fuel economy for the Cherokee 4-cylinder is an EPA-estimated 21/30 mpg city/highway (21/28 mpg with 4WD). The rating decreases to a 19/25 mpg rating for the Cherokee V-6. The Overland 4WD model lowers to the rating further to 18/26 mpg. Inside, the Cherokee has a standard black cloth interior with a 60/40 split-folding rear seat. Maximum cargo capacity is 24.6 cubic feet with the rear seat folded down. The center stack features a standard audio system that includes a 5-inch touchscreen, Bluetooth connectivity for phone and audio, and a USB port. It can be upgraded to a larger 8.4-inch touchscreen, an integrated navigation system, an HD radio, and premium audio speakers. Standard features include air conditioning and power windows/locks. Leather-trim front bucket seats, power/heated front seats, dual-zone automatic climate control, and a wireless charging pad are also available. Nappa leather upholstery, heated/ventilated front seats, a power-adjustable driver’s seat, heated steering wheel, remote keyless entry, remote vehicle start, and a power liftgate now come standard on the Cherokee Trailhawk. Standard safety features include ten airbags, antilock brakes, and electronic stability and traction control. There is also plenty of available safety technology, including front/rear parking sensors, a rearview camera, lane departure warning, forward collision warning with automatic braking, and an automatic parking system. 186 of 195 (95%) consumers said they would recommend this vehicle to a friend.